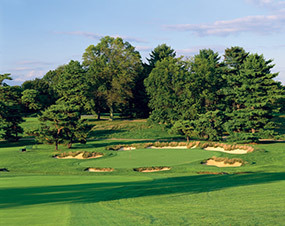 The origins of Philadelphia’s treasured Merion Golf Club date back to the 1865 formation of the Merion Cricket Club, one of America’s earliest sporting organizations. Members of the cricket club, who also dabbled in tennis and bowling, built themselves a simple nine-hole golf course on leased land in 1896. The sport’s popularity quickly increased and they soon decided to seek a more permanent home, establishing a committee to investigate various options and eventually purchasing a compact tract of land near Ardmore, north-west of the city. Engulfed by suburbia and split by what has become a busy avenue, the land was deemed ideal for quality golf as one section was dominated by a dramatic old quarry while the other was cut by a series of ridges and a small winding brook. The committee in charge of building the club’s new course was headed by Hugh Wilson, a Scottish immigrant and accomplished amateur golfer. Wilson had never designed a golf course so during construction he was sent on a half-year trip overseas to study the great British links. Although some of his design concepts were inspired by the holes he saw in Scotland and England, Wilson didn’t revert to building replicas, instead creating some delightful hybrids and a number of truly outstanding originals. His course first opened for play in 1912, but he altered it considerably during the early years, adding bunkers, pushing back green sites and rerouting the 10th to 13th holes to eliminate dangerous road crossings. What makes Merion such a magnificent golf experience is the manner in which every natural feature on the site was incorporated into the design. There is also a superb flow to the routing, with a fierce opening stretch followed by a middle section full of cunning mid-length par fours and an action packed closing run as tough as any in the game. The greens and bunkers throughout the layout are also exceptional. The intricately contoured targets vary greatly in terms of size, slope and the nature of their settings while the distinctive jagged edged bunkers are steeply faced, difficult to escape and so frequently employed that they appear to catch every single errant stroke. 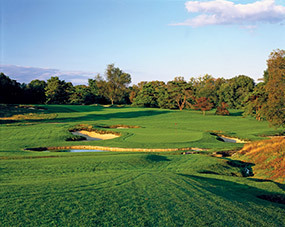 Despite some fantastic holes closer to the clubhouse, the heart of this course lies on the other side of Ardmore Avenue and the eleven gems arranged across the subtle slopes and ridges of the main property. The shortish par fours through the middle of the round are especially good, few offering a genuine incentive for golfers to attack from the tee but all featuring beautiful green sites and testing approach shot challenges. The pitch into the 7th green, set on a natural plateau and guarded by a huge front bunker, is a particular standout as is the approach into the 11th, its small target pressed hard against the creek. 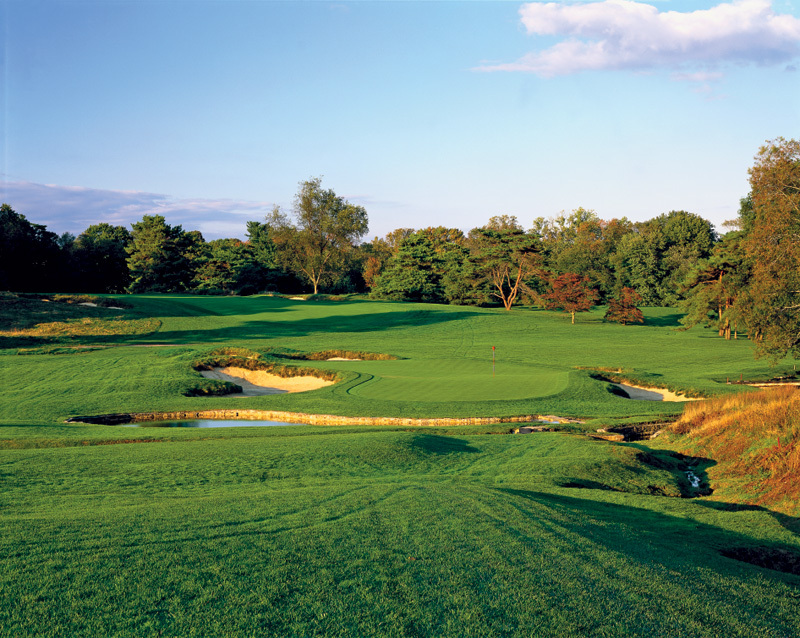 Other world-class holes include the ridgetop par three 3rd and the mighty par four 5th, which pushes 500 yards and bends left along the brook with both its fairway and green leaning strategically toward the water. The putting contours and nasty frontal trap here are incredible, and cleverly punish those who leak their drive too far away from the hazard. The two par fives are also fantastic tests, the 2nd is a narrow uphill teaser that runs along the road, while the 4th heads in the opposite direction and drops over the creek toward a deceptive green that appears to slant forward yet actually falls away at the rear. The nature of terrain changes considerably when back on the clubhouse side of the road, particularly from the par four 16th, which is the first hole to incorporate the quarry. Here the fairway is relatively flat but the approach is a stunning shot up over the nasty hazard and into a large green site that tumbles boldly into a front right basin. The next is a long and tightly bunkered one-shotter that plunges from the rim of the pit down into a slender green with a false front and superb internal contours. 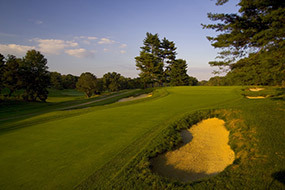 Ending proceedings is Merion’s fabulous finishing par four, made famous by Ben Hogan’s 1-iron during the 1950 US Open. After driving over the quarry wall the approach is played from an undulating fairway up into an imposing target set atop a large crowned plateau. 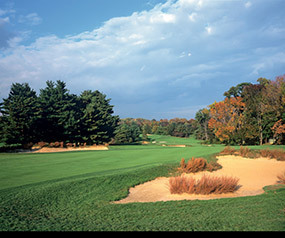 Hugh Wilson also designed Merion’s West Course, but it’s the East Course that has always been the club’s crowning jewel. The layout hasn’t really changed much in the years since his passing, although the fairways have narrowed and the rough has become a more prominent hazard. The holes have also continued to be stretched in an effort to accommodate thwart today’s power hitting professionals. Despite this added length, the great thing about Merion is that it still doesn’t feel super-long, yet it continues to provide a stern examination of all golfers and all playing abilities.